Since people seem to enjoy seeing our hardware (server pron), I thought I'd show our current setup again. I'll start at the bottom of our rack. This is a pic with a few things. First, it's got the white system, which is our memcache box. Just your basic setup (dual dual-core opterons, mirrored 250gig SATA drives, and 32gigs of RAM) for temporary storage of blocks of output. Above it is our Breach WebDefend appliance. I'm not sure the specs (dual quads and 4 gigs of RAM I think), but since it's sold as an appliance it doesn't really matter. 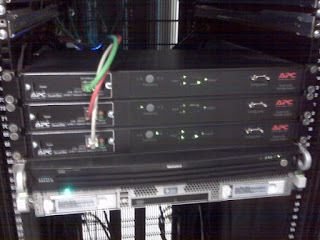 Last in this pic are 3 APC power management boxes. Since quite a few of our devices only have one power supply, this allows us to plug them all in to both power sources in case of an outage. Somehow, it seems I need to defrag my system. I'm not sure I had seen one this bad before. Yay, me.